Homes built after 1920 are more likely to have wall cavities, which is a gap between two layers. Insulation will fill this gap, reducing heat loss and effectively cutting your annual energy bills. How much will I save with wall cavity insulation? With wall cavity insulation you have a cheap way to insulate your home and reduce your energy bills. With cavity insulation you’ll make savings on your household bills and your carbon dioxide emissions. This means you’ll be financially better off, whilst helping the environment with global warming issues. Having wall insulation installed will save you up to £135 every year and considering costs are between £100 and £350, payback is as little as three years. This will help many homes escape fuel poverty, which is classified as spending 10% or more of income on dual fuel bills. On top of this financial saving you’ll also see a major carbon saving, reducing your home’s footprint. As much as 550kg of carbon emissions can be cut every year with the simple installation of cavity insulation. Is my home suitable for cavity insulation? When wall insulation for the cavities is installed, small holes are drilled into the wall at intervals. Insulation is then blown into the cavity with special equipment until the gap has been filled, and the holes are refilled. This isn’t something that can be done with DIY and a registered, professional installer will be needed. The job takes roughly two hours for a trained installer, so it’s a simple and quick method with no mess left behind. Wall cavity insulation is a proven way to reduce your energy bills, and is one of the cheapest ways to slash energy bills. If you’re interested in cutting your expenses and retaining more heat in your home, complete our quick form and receive up to four FREE quotes from vetted and reputable insulation companies in your area. Project: Cavity wall insulation for noise reduction,one wall only. Project: Cavity wall insulation for all walls. Semi detached house. Project: Looking to see it house has cavity wall insulation, and it not a quote for the cost of getting it done. 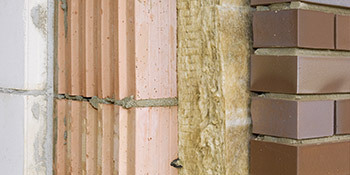 Project: Looking for a price for cavity wall insulation on a 2 storey semi detached house. The surveyor knew his job, but still awaiting quote & fear it will be very expensive. Bright Home were the only company who came back to me and they were good. Made it easy finding a company that knew what they were selling. Doing the job you say you are going to do, and doing it wel,l that says it all. Maybe you could go into running a Rail Network, or perhaps a country they could definitely do with people like you.